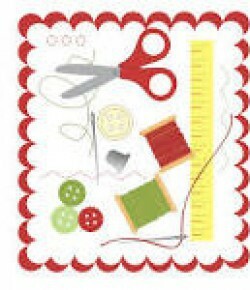 Here it is my entry for the Simplicity Blogger challenge, when I first heard about the challenge I didn’t have a blog but I spent hours reading sewing blogs so I decided to start a blog to share my sewing experiences and so I could enter the challenge. 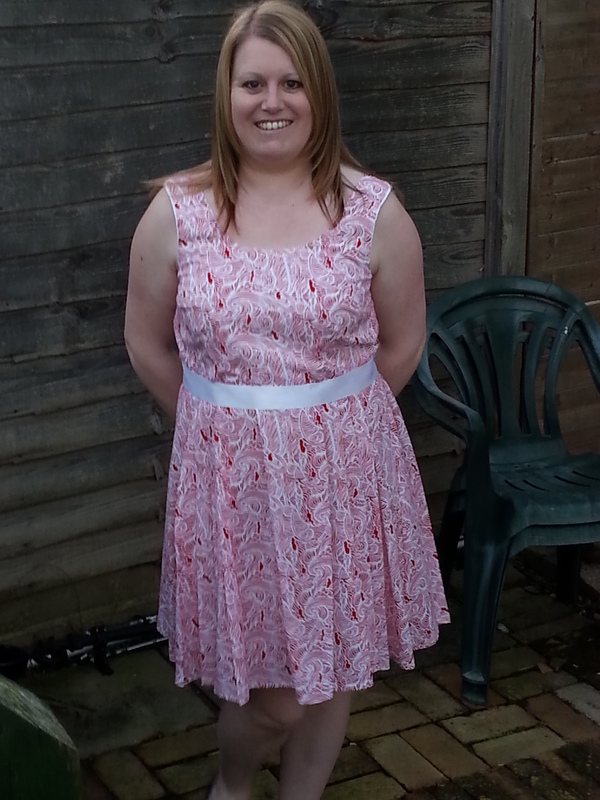 I chose to enter the Best Dressmaking Project which was the New Look 6145 Shift Dress pattern, this style of dress doesn’t really suit my figure as I need more fitted clothes but I thought that I wanted to give it a go and was excited about how I could adapt the pattern. 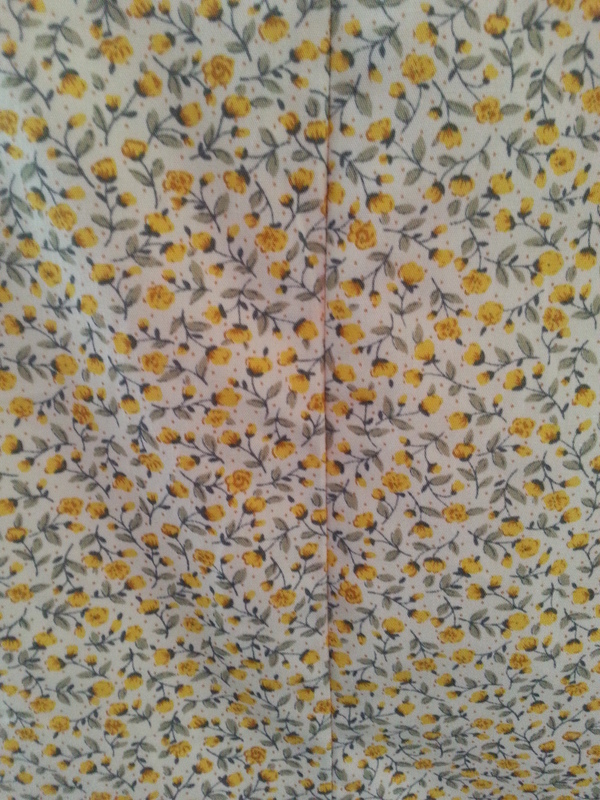 I chose a cotton fabric with yellow and green flowers on a cream background. The pattern was fairly easy to follow, I decided to change the shape of the sleeves and make them shorter and only have a few gathers at the top, I used the sleeve pattern piece from the New Look 6262. This dress has a concealed zip, I always dread them and can’t always remember how to put them in even with the pattern instructions so I sometimes have to resort to youtube for a quick reminder, this zip went in without any dramas. 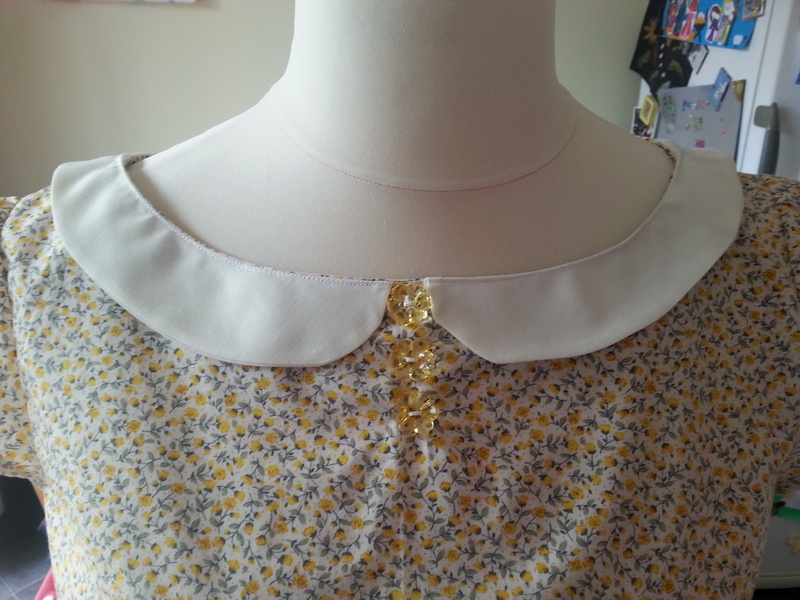 As you can tell from my previous posts I love a peter pan collar so I decided that this dress needed one, I drafted the collar using the back facing pattern piece for the back of the collar and for the front I used the front facing pattern piece I used my french curve ruler to give shape to the collar, I think it turned out ok, I top stitched the collar so it would lie flat, I am really pleased with the collar especially as I drafted the pattern pieces myself. 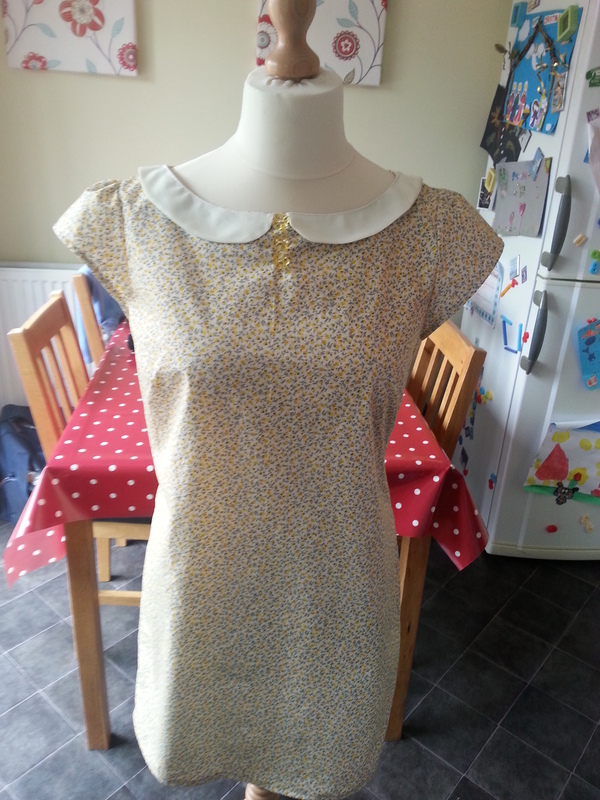 I added three yellow flower buttons by collar and I also made the dress shorter by a couple of inches. 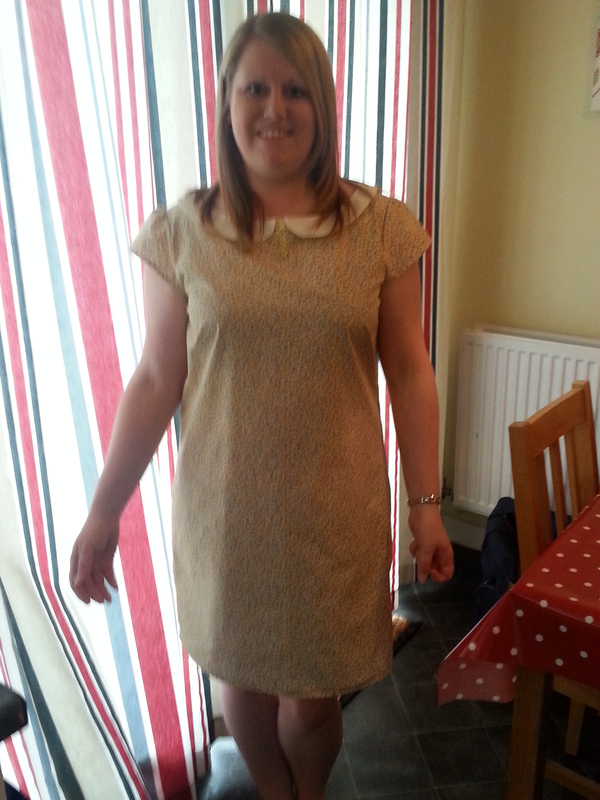 I am really pleased with how my dress has turned out and I think the dress has a bit of a sixties style to it, I have enjoyed taking part in this challenge and I am looking forward to seeing the other entries. 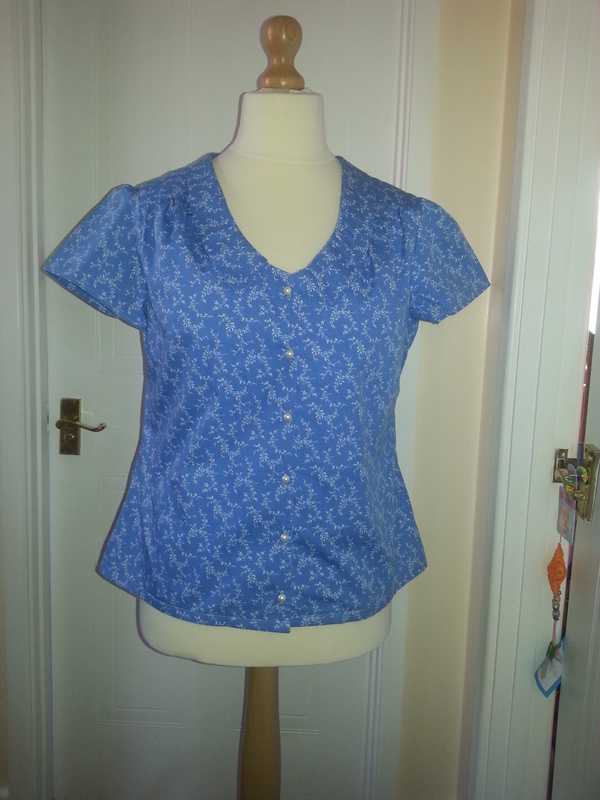 The first time I saw the pattern for the Sewaholic Alma Blouse I was so happy I needed a pattern that I could make tops for work and that would go with skirts, jeans well everything really and this is that pattern. I really like the style of all of variations I decided to make View B as I love the collar. I chose a lovely fabric in duck egg blue with tiny dots in brown and burgundy and for the collar I chose a brown cotton to pick up the colour from the dots, I loved the combination of both these fabrics. The pattern is lovely and the instructions were very clear I chose to cut a straight size 14 and didn’t make any alterations it was very quick to make up. I chose to make the sleeves shorter and with gathers at the top, also I followed the pattern and interfaced the collar but as my fabric was thick it made the collar quick bulky and I had to trim the seams quite a lot on the collar to get it to lie flat. 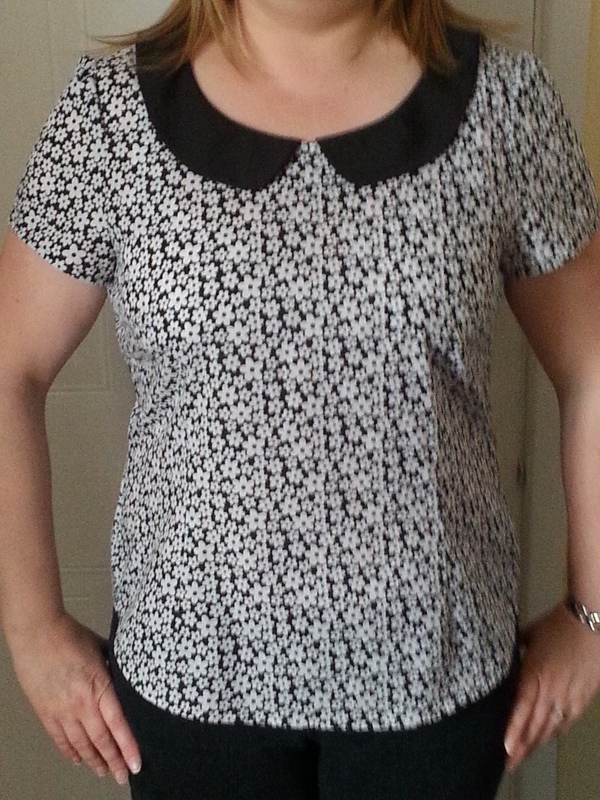 I love this top, the fabric choice and the style but as I am still learning to get the right fit and I because I didn’t make any alterations it just didn’t fit, the collar and neckline gaped so much as did the fit around the bust and the darts just weren’t where they were supposed to be. 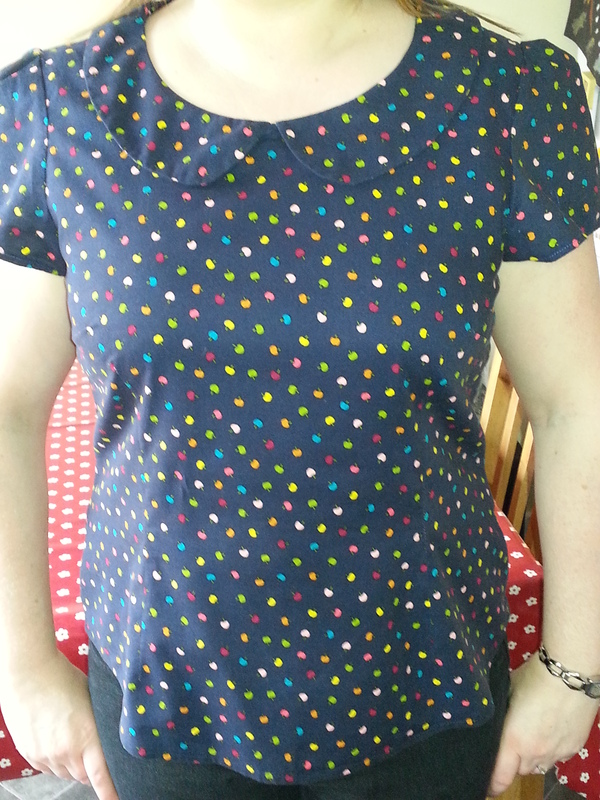 I was gutted but I thought I would not give up and try to make some adjustments to the pattern to get it to fit properly, I measured my Alma blouse and looked at the finished garment measurements and my measurements, I decided to retrace the pattern with a size 10 neckline and collar, a size 12 down to the waist where I then went out to a 14. I made a muslin with some fabric I had left from the first ever skirt I made it was a lovely navy blue fabric little apples all over in different colours, because this top was the second one I’d made it went together even quicker, I didn’t use any interfacing on the collar and I also made the collar slightly smaller and again used shorter sleeves with little gathers. 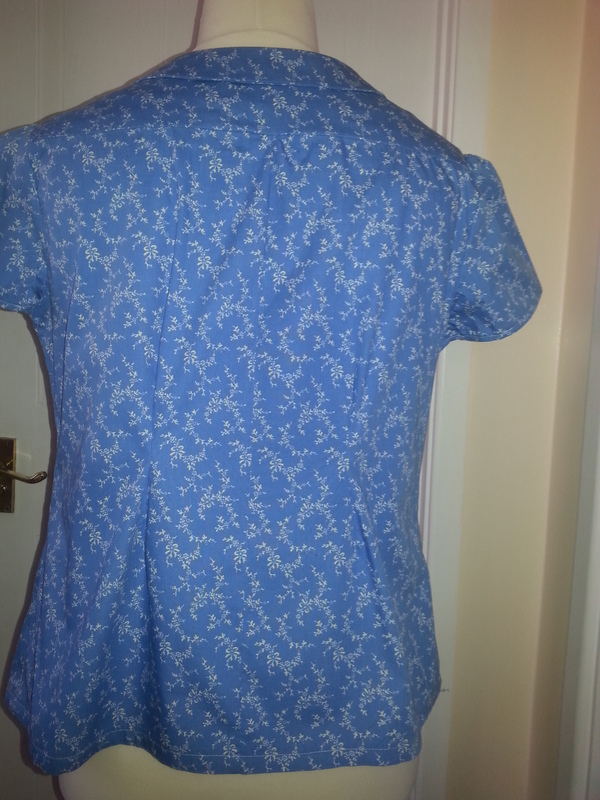 The blouse came out amazingly well, it fitted perfectly, there was no gaping at the neckline and the collar laid flat, the top fitted closely at the bust and then out at the waist, I didn’t need to put in the concealed zip (hurrah) as it is easy to get on and off. Even though this was supposed to be muslin I loved it so much I worn it to work the day after finishing it and had some lovely comments from my work colleagues, I have also worn it a few times with jeans it’s so comfy. I feel so happy that I have found a pattern with a style that I love and I feel so proud that I have actually made something that fits, I just want to make more and more of these tops and the fact there are 3 different neckline and sleeve options means I will be able to fill my wardrobe with these blouses along with my other favorite pattern the Mimi Blouse from Tilly and the Buttons. This also means I won’t need to go clothes shopping for tops which makes me happy (I hate clothes shopping), I am well on my way to creating a handmade wardrobe. Love at First Stitch by Tilly and the Buttons is one of the best sewing books, as soon as I got this book I wanted to make everything that was in it. 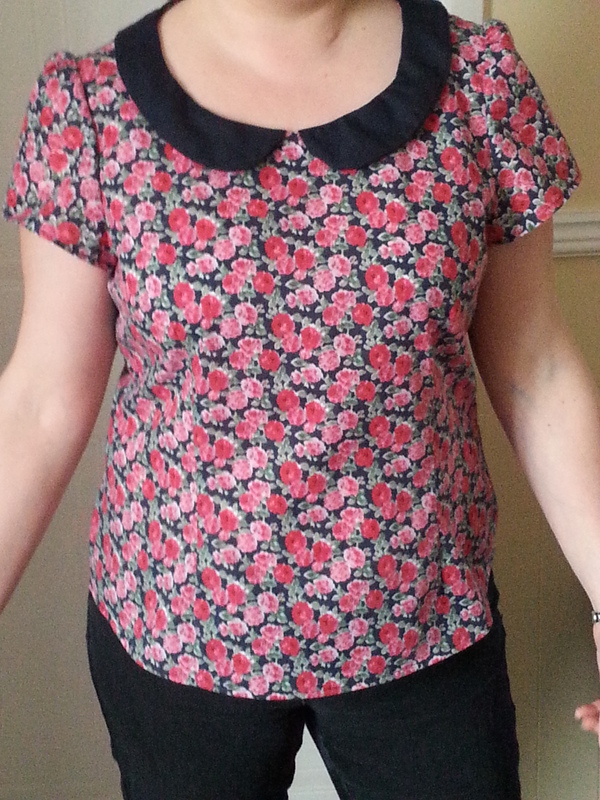 After my Lilou dress I decided to make the Mimi Blouse, the pattern was lovely the instructions were very clear and even tho I had never constructed a top with a yoke, a collar or put in button holes I enjoyed making this top. Again I rushed into this make, I went with the measurements for my size and I wish I had looked at the finished garment measurements as the blouse is quite loose-fitting, I would have chosen to trace the pattern two sizes smaller. 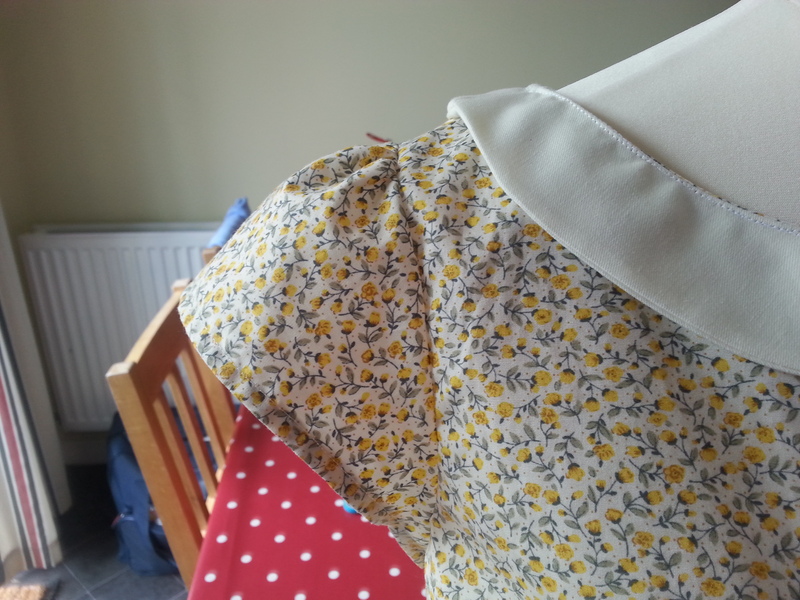 I loved the yoke and it was simple to construct, I decided as the top was quite loose to take out the gathers in the back and put a back seam in taking out the excess fabric, I also put in some diamond darts in the back to give some shape. I had never made a collar before but the instructions and the pictures were so good that the collar was easy to construct even attaching the collar was fairly easy. The sleeves I changed slightly making them a bit shorter and not putting the pleat in but gathering the sleeves instead. 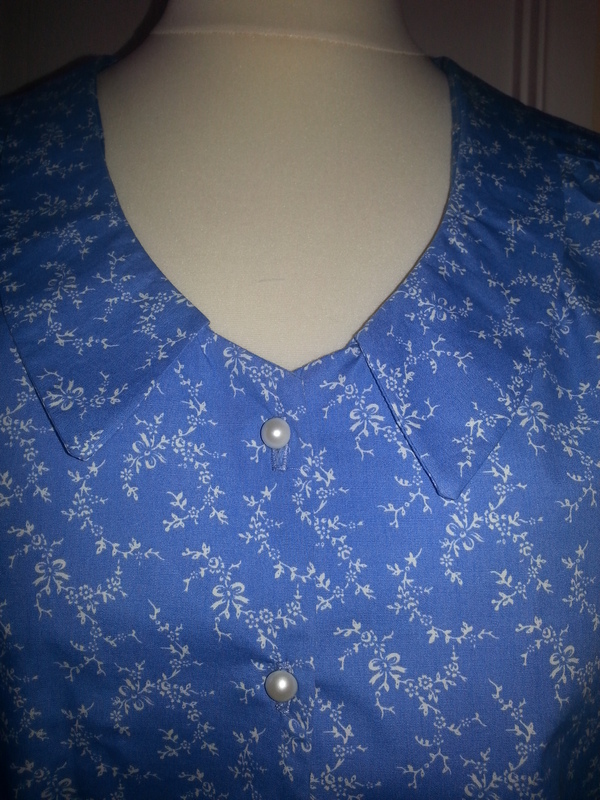 I was absolutely dreading the buttonholes but I measured and measured the position of the button holes and using the four step button foot I managed to put the button holes in perfectly first time, I chose some lovely little pearl buttons which I think go really well with my fabric. I was so proud of my button holes that I wanted to shout and show everyone unfortunately my partner was out and my daughter was in bed so I rang my sister bless her she did try to sound impressed. I think am going to be making lots of these but I do think for my future Mimi’s I will cut a smaller size. I really enjoyed making this blouse, it’s so comfy to wear and feel I learnt so much making it, and have I have increased my sewing skills, it’s definitely one of my favorite patterns. What shall I wear to my Cousin’s wedding after my Lilou Dress from Tilly and the Buttons didn’t work out, well on a whim I decided to pop into my local fabric shop (it’s also the only one in my town) I found some lovely royal blue satin fabric with big pink and peach flowers I fell in love with this fabric straight away. I had only sewn with cotton up to this point, a bit ambitious but I felt I could not live without this fabric. 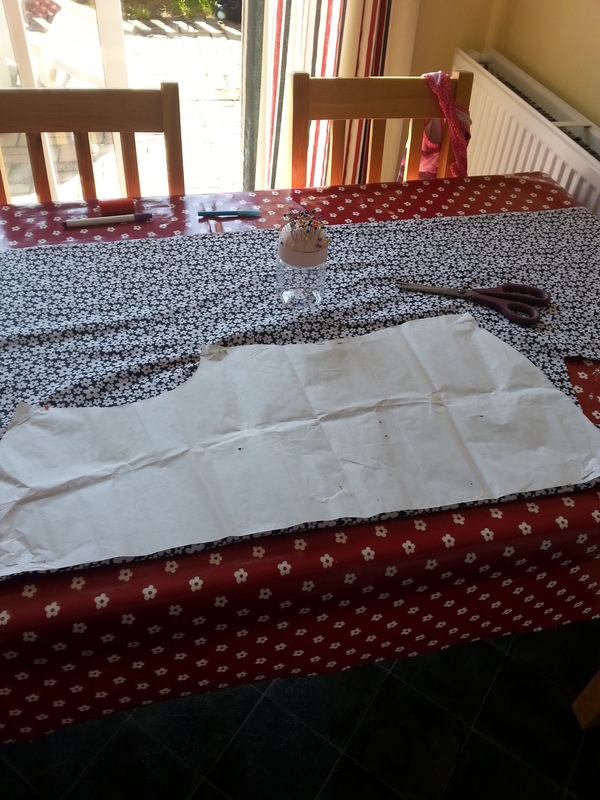 Next hurdle what was I going to make – I chose a New Look pattern 6262 and chose version C a fitted V neck bodice with a gathered skirt. You would have thought I had learned to make a muslin first but I just went straight ahead and decided to make this dress. 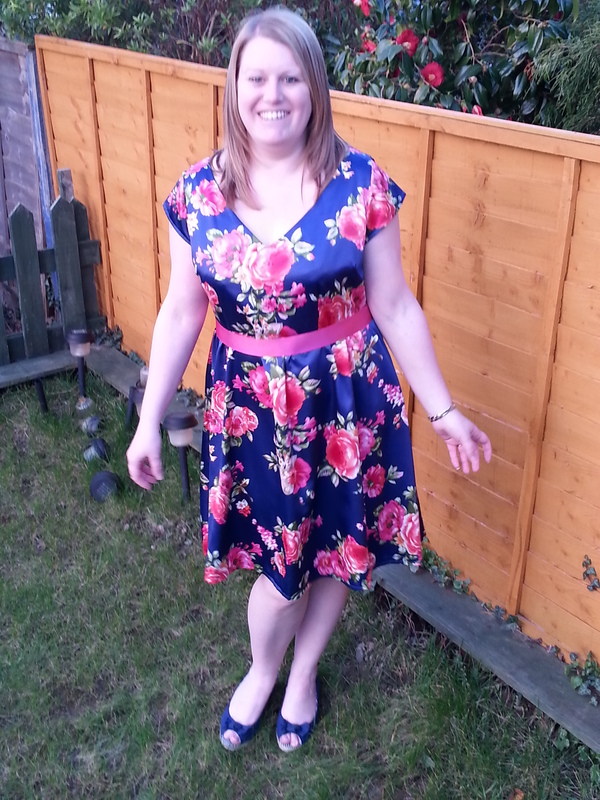 This was a lovely simple pattern and the fabric was a dream to work with the dress came out better than I thought the neckline was a bit lower and gaped a bit but nothing I couldn’t live with and the back was a bit loose, I think I could have made the dress in a size smaller but I decided to attach a ribbon around the waist to bring it in a bit which I think finished the dress off. I wore my dress to my cousin’s wedding it was a beautiful day and I felt very proud of myself and had a few compliments on my dress and it was lovely to say I made it myself. My Cousin and I both got engaged on the same day (Christmas Day 2013) my partner and I decided we weren’t in any rush to get married but my cousin decided she wanted to get married as soon as possible (7 months later they were married). So I had to find something to wear and as most ladies we worry about horror of horrors someone turns up in the same outfit, I thought right I can do this I can make a dress, I had just bought myself Love At First Stitch by Tilly and the Buttons ( I saw Tilly on the Great British Sewing Bee and thought she was brill). I decided The Lilou Dress was THE dress for me to wear to my Cousins wedding, so I set about making it, the instructions were brilliant and very clear and having the photos was such a help, my sewing skills however were not up to scratch and I didn’t make a muslin. The top of the dress is a lined bodice which went ok, even my first attempt at pleats went well and my zip went in like a dream – the problem with the dress was ME, I have a real problem with my upper arms and lots of things went through my mind could I attach sleeves or wear a shrug but I just thought with only a couple of weeks til the wedding (nothing like leaving things til the last minute) I thought I would have to give up and buy something. 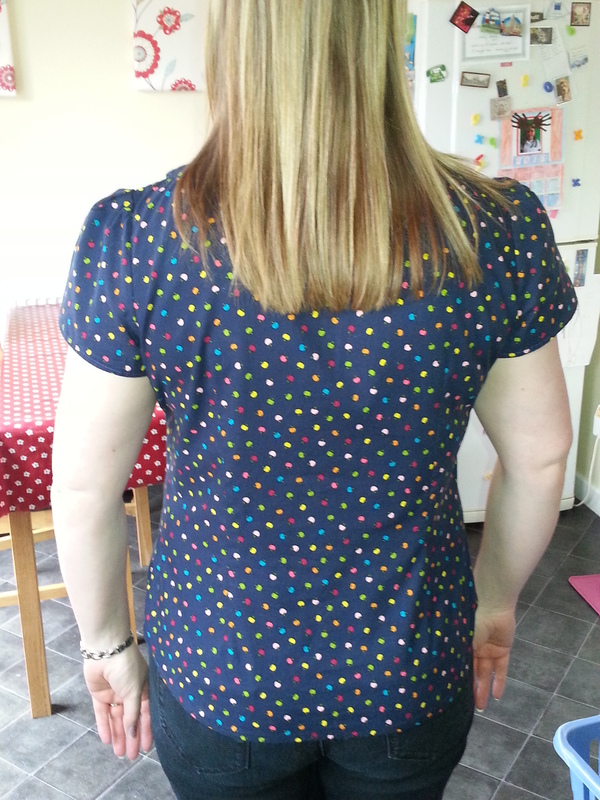 The pattern was amazing but my choice of fabric and my body hang ups just does not do the pattern justice – I didn’t even finish the hem and put it in the wardrobe to one day finish it. After my sewing workshops I started making tote bags for my daughter and her friends and I made a couple of bucket bags. 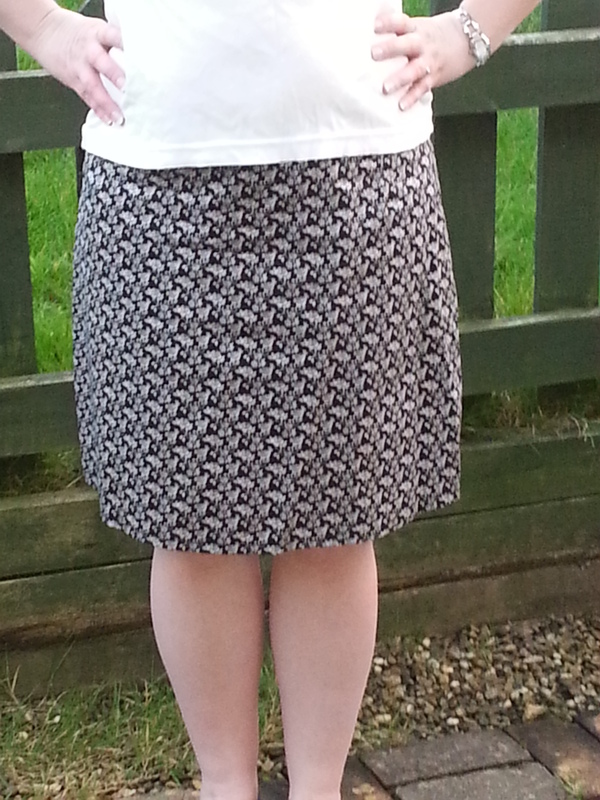 Then my first big challenge to make an A-Line skirt from a commercial pattern enter Mccalls pattern 3341, I had a few sizing issues – I didn’t realise how different the sizing on patterns was to ready to wear clothes , it was a bit of a shock to cut out such a large size (I kept telling myself it was just a number) the finished skirt was quite big and I ended up taking in a couple of inches at the side seams, I really liked the waist line facing and the pattern was really simple and clear to use. 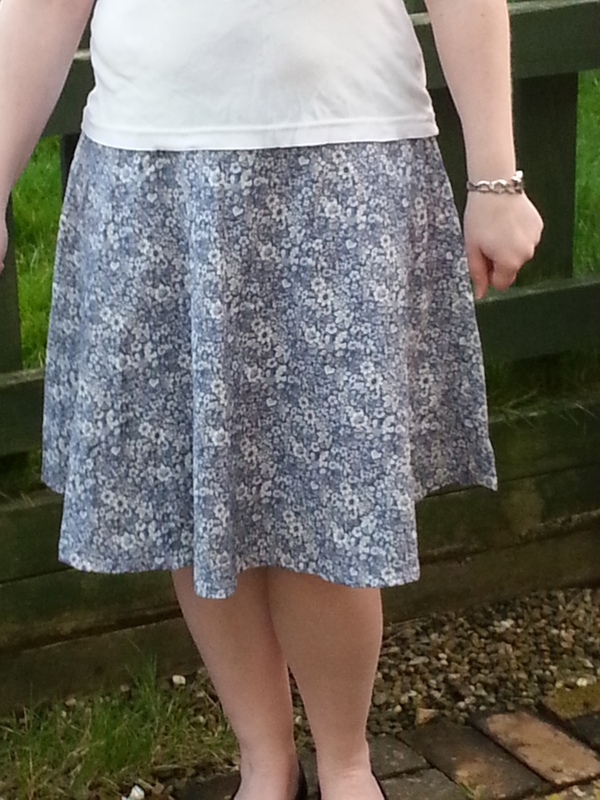 I did end up with a wearable skirt. A New Look Pattern 6843 came next with a binded waistband which I didn’t like as much as the faced waistband on the Mccalls pattern. The skirt turned out ok but again I didn’t read the pattern properly and my sizing was completely out so again had to adjust the seams.